Who wouldn’t feel super excited when it comes to travelling? Perhaps not everyone, but most people would be so enthutiastic, busy planning the itienary and imagining just how great would the trip be. For someone who loves travelling, even the thought of going on a trip is too exciting. However, at times it might be hard, confusing, and tiring to think of things to do when you visit Altai mountains because we simply don’t know and got no clue. Perhaps you’ve surfed the internet and have found interesting facts of Altai Mountain that really thrills you to save money for your next sweet escape. Despite the fact that you have no idea about what to do, you’ve decided to do so. But, the thing is that you can’t never get bored when it comes to nature, especially Altai mountains. There are a lot of fun things to do in this beautiful natural sites, even those which are weird and unusual things to do in Russia might fit. Who’s excited? Camping might be something that we used to do as a student, with fellow students and teachers during the summer. As time flies, we might even forget how it feels like to sleep out in the wild, relying on the campfire to keep us warm. Camping on the campsites when you’re in Altai is definitely a must! Perhaps one or two nights, spare few days to camp here, not in the national park zones, though. Get closer to the nature this way can’t go wrong. If you get a chance to camp here in Altai campsites, make sure you set your own campfires there. Learn to know how before you go and get immersed in the way of living back in the past. Getting yourself warm with the warm campfire at night will surely be a memorable things to you. Be it early from the dusk, when the sun rises, or in the calm evening till dawn, you should enjoy your walk here in Altai mountains. Walking slowly, enjoying the beautiful view that Altai offers you might be something very basic, yet it’s the best way to let yourself free from all of your thoughts, burdens, and stress. As soon as you get your feet on the grass, breathing in the refreshing mountain air, you’ll find yourself immersed in the nature. Not just good for your mind and soul, it’s a great exercise before filling up your stomach with yummy foods! Want more challenge and thrill? 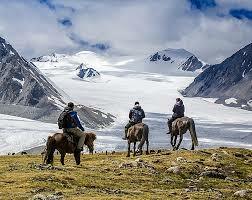 Try hiking the Altai mountains instead of just walking around. You need to make sure you’re occupied enough though. If you’re a beginner, at least try to find out the guide to hiking. Safety should never be abandoned, no matter how much you want to seek for fun. Getting the whole landscape of Altai mountains from its tops would be a super cool things to do when you visit Altai mountains. Rafting is a very popular thing that most people would die for here. If you’re an adventure seeker and seeking for more challenges, rafting is a must in your schedule. Rafting in this wild river is world class. Get yourself wet being in touch with the water. It’s a very fun thing to do that will also be memorable for you. Even if it might be a bit cool, you’ll never regret ever try it. Challenging yourself and let your adrenaline rushes through your body could be super exciting, don’t miss it out. If you’re less adventurous, at least swimming would be a great option for you. Get yourself lost in the sensation of swimming in the mountain rivers. Get soaked in the water would leave a great impressions on you even if it’s a bit chilly. What if your trip is during winter? Well, swimming will then be one of the crazy things Russian do for fun in winter. Remember to be careful when choosing the river you want to jump right into. Safety matters, right? Although the villages might not be that large, you can’t miss getting in touch with the locals here. Most of them are farmers living simply in the Altay villages. Getting inspired by the way they live would be great, wouldn’t it? You might also get the chance to know more about the culture and habits there. Don’t just bring photographs when you go back home, yet bring inspirations and cultural knowledge. Who knows you can even discover wonderful facts of Russian agriculture as you get lost in Altai mountains? Fishing is one of a good way to spend time in the nature. Enjoying the beautiful Altai while waiting for the fish to get caught won’t make it feel like forever. Bring a fishing rod and experience fishing here in Altai. You might want to prepare campfires to grill it right away as well. What a great thing to do, enjoying grilled fish fresh from the water in the wonderful Altai would be unforgettable! Near the campsites of villages, you might find a warm wooden house where you can enjoy steambath. In the cold freezing water, it would be good to enjoy the warmth here. In fact, it would be the most possible things you can do during winter in Russia, especially Altai. Warm or luke-warm water will give you time to relax, give your body chance to let the locks loose. You can even enjoy ‘swimming’ in the winter without worry about freezing. In the Republic of Altai, you can find the Chuysky Trakt, a main road in Altai. It’s often called the Silk road, as back in the past it’s included in the northern route of the Great Silk road. Enjoying a ride in the Altai with windows wide open would be a great thing to experience while in Altai. Of course, you can meditate, or simply take some time to think deeply about life, about yourself. But, going on a trip to Altai mountain alone means you should take this chance to think deeper. As you enjoy the mountain breeze, all alone in the nature, your mind will be in a very peaceful state. Just close your eyes, take a deep breath and think for a while. Snap out of your stressful thought, deadlines, and work issues will be good for you to clear your mind. Start fresh soon when you’re going back home. Beside those 10 things to do when you visit Altai mountains mentioned above, you surely can find a lot more things that you can give a try. Visiting this place should give you everything you expected. From cultural experience, nature sightseeing, even refreshing your mind and soul. Make sure you take your time to think of what you really want to do there, so that you ain’t got nothing to regret. No need to worry about leaving things you really wanted to do undone when you got the itienary fixed before going on your trip.